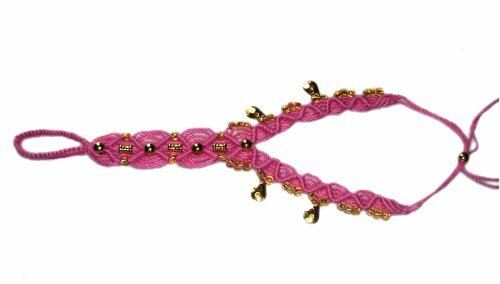 Description: Feminine Jewels is a Micro-Macrame design featuring diamonds and a serpentine stitch, made with Double Half Hitches. 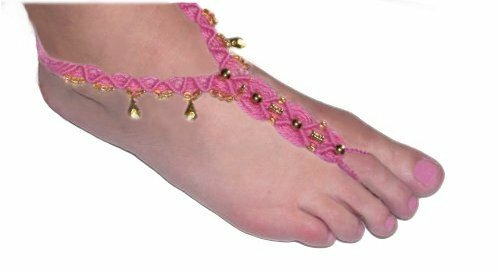 Barefoot Sandals, also called Foot Jewelry, have become very popular in recent years. By using light colors and adding beads and/or charms, this design will be a very feminine way to decorate your feet. 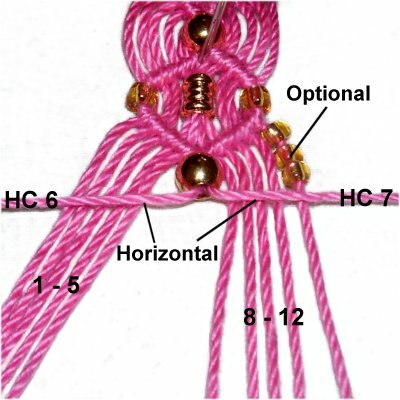 This Macrame Pattern is rated Moderate, due to the fine materials used in construction. 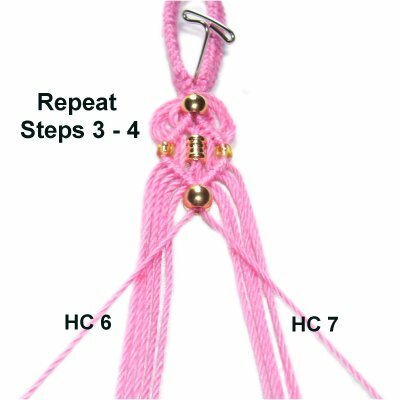 Beginners should practice the knots several times, in order to successfully create this Micro-Macrame project. 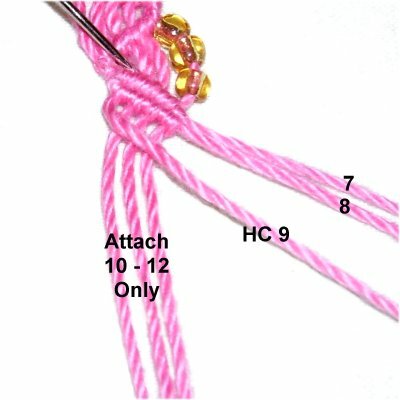 The loop is arranged around the second toe. The area with the diamonds fits on the top surface of the foot. The two straps go around the ankle, and are secured in the back. 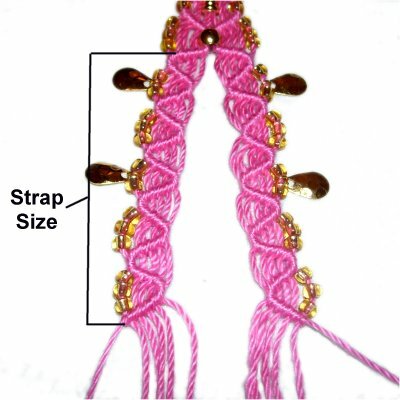 The closure is a simple bead clasp. 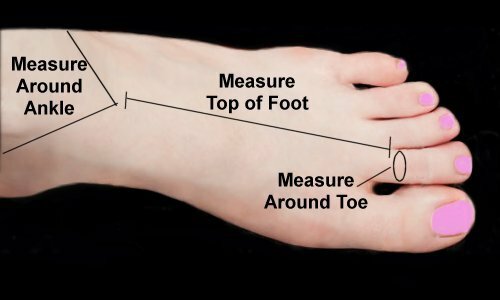 Measure your foot as shown below, so you can determine the size of each section of the Feminine Jewels. 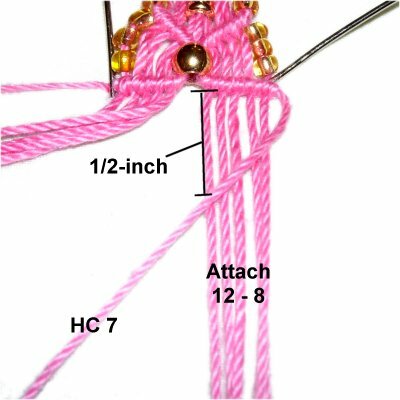 When you are finished, add all three measurements together so you know the total length you need to make. To determine the size of the toe loop, measure around your toe and add 1-inch. Measure from the toe crease over the top of the foot, to determine the length of the diamond design. 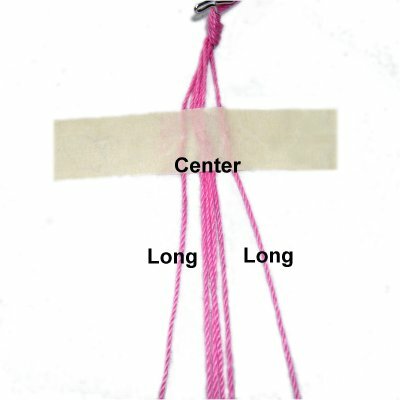 Measure around one side of your ankle to the back, to get the strap length. Cut the cords longer if the total length you need is over 7.5 inches. Prepare the cords by applying glue to the tips. Step 1: Secure the cords on your board vertically, with a piece of tape to mark the center. The two 3-yard cords should rest on either side of the other four. 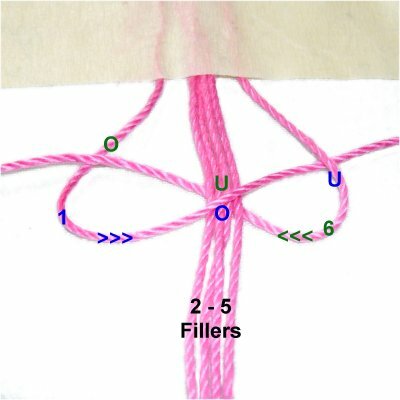 Cord 1 goes over the fillers (2 - 5) and under cord 6, heading left to right. Cord 6 goes under the fillers, and over cord 1 as you pull it out on the left. Cord 1 goes over the fillers and under cord 6, heading right to left. Cord 6 goes under the fillers and over cord 1 as you pull it out on the right. Step 1, continued: Tie several more SK, stopping when the sennit is HALF the size of your toe measurement. 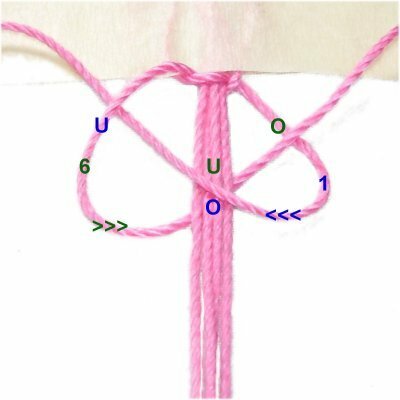 Add an extra 1/4 to 1/2-inch so the loop is a little loose, which will be more comfortable. Turn the sennit around and return to the center to make the second half of the toe loop. 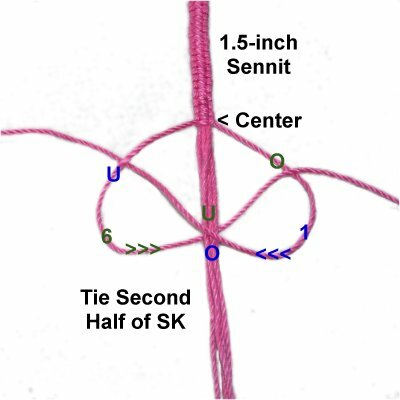 Begin by tying the second half of the SK, in order to continue the pattern without interruption. 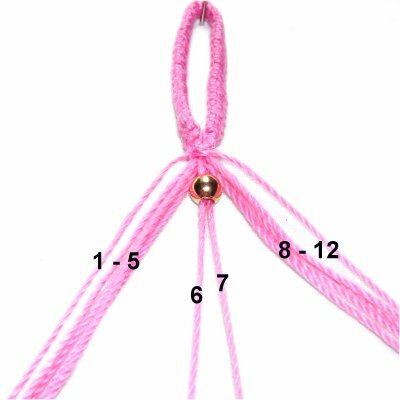 Tie the same number of knots as in the first half of the band. Important: Verify that the sennit fits comfortably and goes all the way around your toe. Add extra knots as needed (both ends). Step 2: Fold the sennit so the top flat surface of each half faces each other. 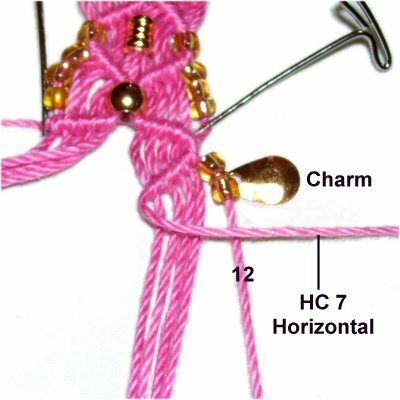 Side View: This shows more clearly how the toe loop for the Feminine Jewels should be folded. Use the two lower working cords (resting on the board) to tie a SK around all the other cords. Step 3: Organize the cords vertically, mentally numbering them 1 - 12. 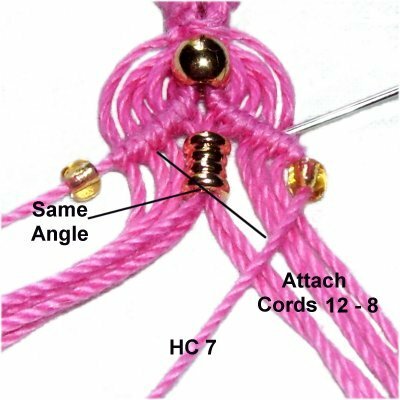 Cords 6 and 7 are the holding cords for the Diamond designs. Slide one bead onto both of them. Move holding cords 6 and 7 diagonally to the right and left, securing them on the same angle, on top of the other cords. This is important, so you don't end up with lopsided diamonds in your Feminine Jewels. Attach cords 5 - 1 to holding cord 6 with clockwise DHH (in that order). Attach cords 8 - 12 to holding cord 7 with counter-clockwise DHH. Step 4: Keep the holding cords secured and organize the others as shown. Attach one of the long beads for the inside of the diamond to the four cords in the center (working cords 4, 5, 8, 9). Place one E-Bead on each holding cord. I recommend you do this in order to help form the corner angle of the diamonds. This area of the Feminine Jewels will be more oval in shape without the beads. 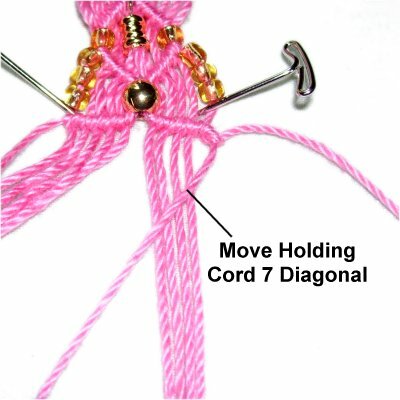 Move holding cord 7 to the left, and secure it on the same angle as the knots on the upper left. Attach cords 12 - 8 to it with clockwise Double Half Hitches (in that order). 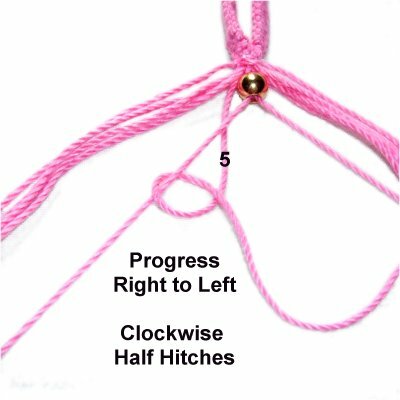 Move holding cord 6 to the right, securing it so it lines up with the last knot tied in the previous step. Attach cords 1 - 5 to it with counter-clockwise DHH. Attach holding cord 7 to it as well. Step 5: Repeat Steps 3 - 4 at least two more times. Measure the area with the diamonds as you progress. Stop when it's the length you determined when you measured your foot. 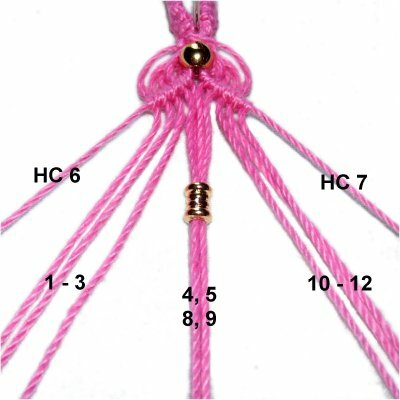 To begin the straps for Feminine Jewels, mentally re-number the working cords and divide them into two groups (1 -5 and 8 - 12). Place a round bead on cords 6 - 7. Optional: Place three E-Beads on cords 1 and 12. Step 6: Arrange holding cords 6 and 7 horizontally, on top of the other cords. Attach cords 5 - 1 to holding cord 6 with clockwise DHH, in that order. Moving holding cord 7 to the left, on a diagonal slant. Measure from the horizontal row down to where cord 8 will be attached. That distance should be around 1/2-inch. 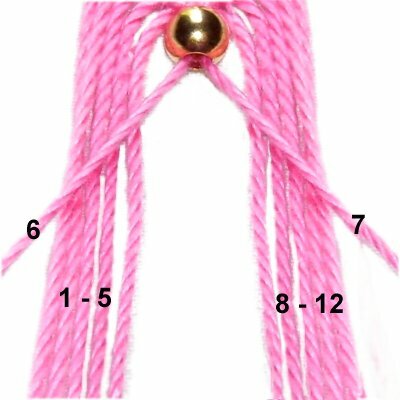 Important: The measurement between the rows should be the same throughout the straps of the Feminine Jewels, so the angles are consistent. Measure each time you change the direction of the holding cord. << Attach cord 12 while controlling cord 7 in your hand, arranged almost vertically. 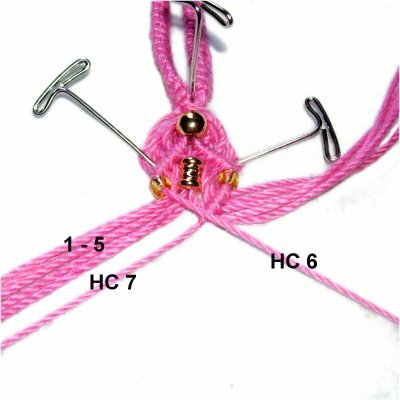 Step 6, continued: Attach cords 11 - 8 to holding cord 7 with clockwise DHH. 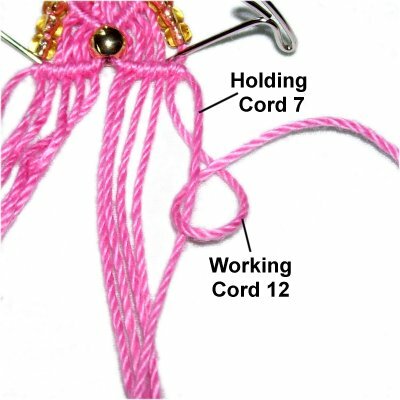 Add beads and/or a charm to cord 12. 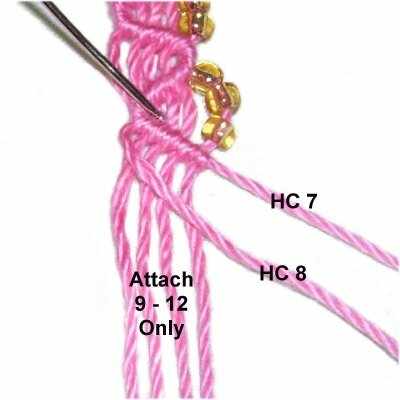 Attach cord 8 to holding cord 7 with a counter-clockwise DHH. The holding cord should be almost vertical. Move holding cord 7 to a horizontal position. Make sure there is 1/2-inch between it and the corner angle above. Attach cords 9 - 12. Design Tip: You can add beads to any of the cords in this area of Feminine Jewels. 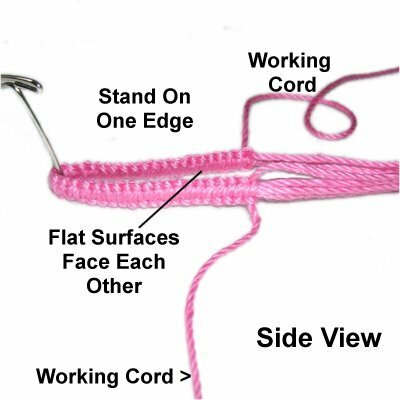 The best placement is on the last cord you attach, where the angle is widest. Step 7: Repeat step 6 several more times, until the right strap is the ankle measurement. Repeat step 6 to make the left strap, attaching the cords to holding cord 6. Try to keep the angles the same as on the right. Verify that the Feminine Jewels fits properly before moving on to the finishing steps. 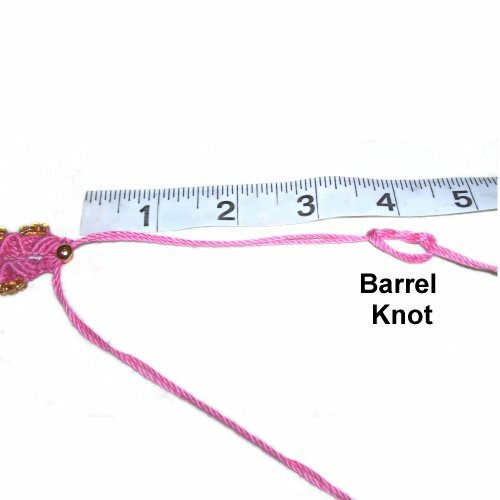 The knots described below add approximately 1/4-inch to the overall length. Step 8: On the right strap, move cord 8 to the right, as the next holding cord. Attach cords 9 - 12 to it with DHH. 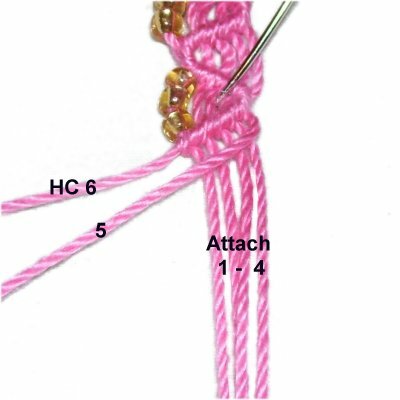 Tighten the knots firmly so the two rows are close to one another. Do not attach holding cord 7. Move cord 9 to the right, as the next holding cord. Attach cords 10 - 12 only, NOT the other holding cords. Move cord 5 to the left. Attach cords 4 - 1 to it with DHH. Move cord 4 to the left, and attach cords 3 - 1. 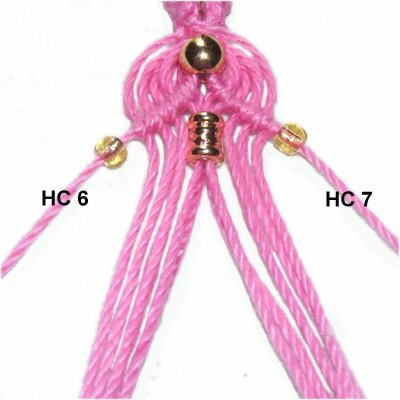 Step 9: Mentally number the six cords coming from one strap of the Feminine Jewels. 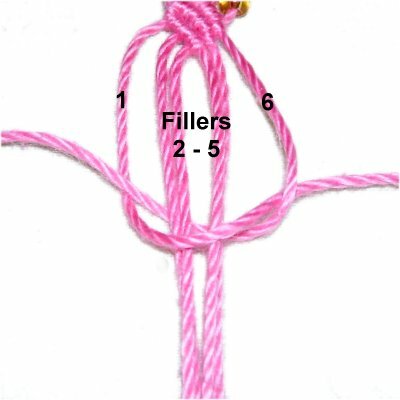 Use cords 1 and 6 to tie a Square Knot around the fillers, which are 2 - 5. 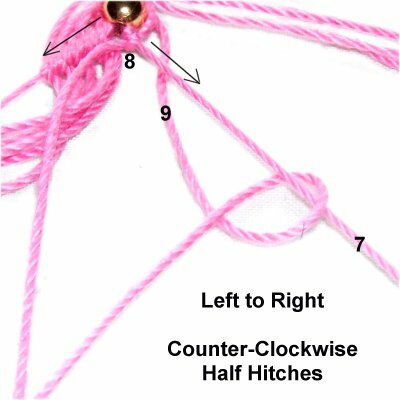 Apply glue while tightening this knot. Turn the strap over, so you work in the back. 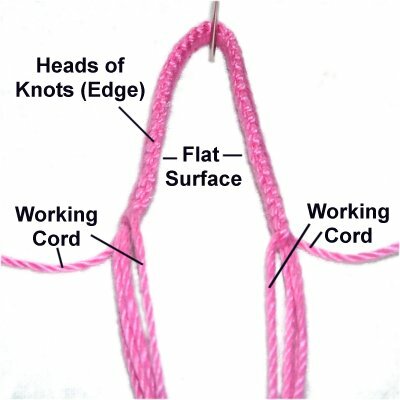 Tie off cords 1 and 6 with a Barrel Knot, applying glue while tightening. Tie off 2 cords from the group of fillers as well. The remaining two cords are for the clasp. Step 10: Repeat step 9 to finish off the cords for the other strap. 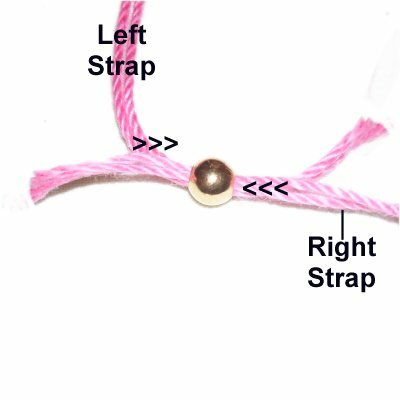 Step 11: Pass the two cords from the left strap through a bead from left to right. Pull on the cords to close the clasp. To leave plenty of space for your foot to fit into the Feminine Jewels, move down at least 3 - 4 inches from the bead. 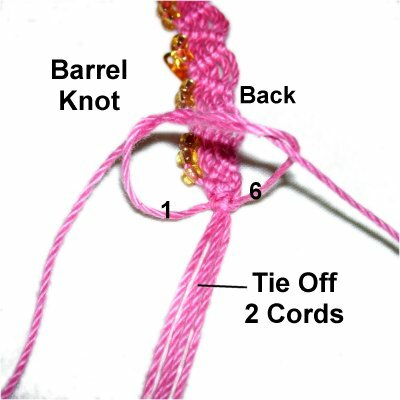 Tie a Barrel knot with the two cords acting together. Have any comments about the Feminine Jewels? Contact Me.